Last weekend in Washington D.C. there was a reunion of former ASP summer staff members. 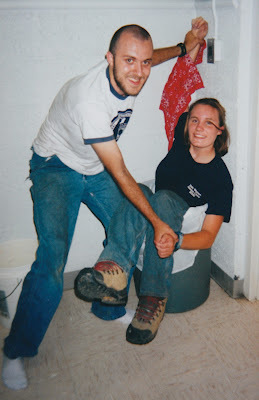 I worked for the Appalachia Service Project during the summers of 1997-2000 while I was in college. Around 75 former staffers descended upon the nation's capital (well, a number of them already live there) for festivities. After a 12 hour drive (and a one hour bike ride) I arrived at the Potter's House bookstore and cafe for some live bluegrass music. As soon as I walked in I recognized four or five familiar friendly faces... and about 30 very unfamiliar ones. Has it been that long? I scanned the store and noticed my former staffer Jill on the other side of the room. The way ASP works is there is a separate center in each of 20 or 25 counties throughout central Appalachia. Each center is run by four staffers. 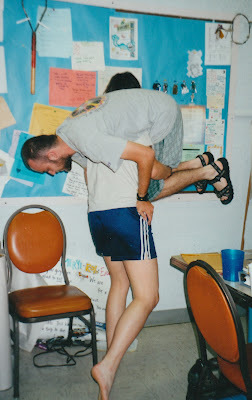 Jill & I worked together at the same center in the summer of 1999. Great, I thought, I'll go say hello. As I walked about half way across the room I took another look, then I stopped in my tracks. Wait a minute... that's not Jill... is it? She looks like she hasn't aged at all. My confusion was further compounded when she made eye contact with me and showed absolutely no sign of recognition. This was a person I worked with very closely for several months, what's going on??? While I was standing there, not knowing what to do, Phoebe walked by and I asked her if that was Jill. No. 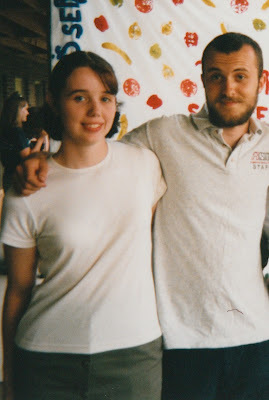 It was Jill's younger sister, who looks exactly like Jill, and who apparently also worked for ASP. Well, that solves that mystery. The real Jill was present at the banquet on Saturday night. We had a good chance to catch up a little. She is finishing up with medical school and getting married soon. ¡Felicitaciones! After the long drive and a few hours in the coffee house I was really ready for bed. Will works in D.C. for CEDC, a nonprofit that has dormitories, and he arranged for me (and a few others) to stay there fairly inexpensively. It was nice, and the price couldn't be beat. I slept in a little Saturday morning before heading downtown to see the monuments. In the afternoon, the event organizers planned a service project at the Capital Area Food Bank. Around 20 or so of us from ASP helped unbox bulk canned foods and reorganize and repackage them for distribution to individuals and food kitchens. It was a good time. I used the opportunity to get to know some of the younger people who were on staff in the years following me. Interestingly, a few of them already knew who I was. You get bonus points if you can guess how -- The Rob Song. After finishing up at the food bank I got ready and headed over to the banquet on the other side of town. During my cross town trip I encountered four roundabouts (traffic circles). Fantastic. Anyone who knows me knows that I love roundabouts. I believe they are the greatest traffic control device in existence. The problem is that D.C. has the worst roundabouts I've ever seen (in the U.S., Nicaragua, France, or Belgium). Typically, traffic entering the roundabout has to yield to traffic already in the roundabout, but traffic in the roundabout should keep moving. Not only did these D.C. roundabouts have stop lights (rather than yield signs) upon entering the circle, they also had stoplights inside the circle itself. ¡Que terrible! So instead of none of the traffic stopping ever, all of the traffic stopped multiple times. This is how the first three roundabouts were. When I reached the fourth roundabout, it was normal (no stop lights, no stopping). Traffic moved so much more smoothly and safely through the fourth roundabout. I cannot possibly fathom why the first three were so messed up. Once I got to the reunion banquet I saw many more familiar faces. There were a couple dozen people whose employment with ASP overlapped mine. One of the first people I saw was Ben, who immediately asked me "were you ever on stage during a Steve Jobs keynote?" That came out of nowhere. Yes, I was on stage during Steve Jobs' 2005 WWDC keynote presentation. My boss (Theo) & I demonstrated Mathematica running on the just announced Intel based Mac computers. Ben watched the video of the keynote (here's the relevant clip), recognized me, and remembered to ask me about it the next time he saw me (three years later). Funny. Besides Jill, my only other former staffer (with whom I worked closely) at the reunion was Meryl (a.k.a. Marl, who was recently married). We too had a good chance to catch up with each other (though we didn't get the chance to reenact our infamous, no holds barred wrestling matches). The banquet was a really good time. We ate Appalachian food (whatever that is). 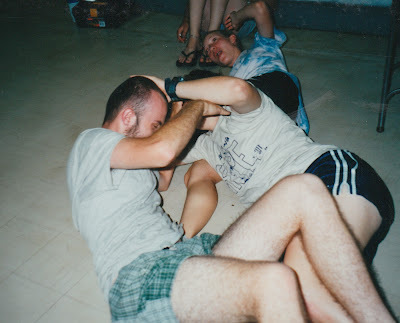 We viewed a wonderful slideshow of old ASP photos. A preselected representative of each decade (70's, 80's, 90's, 00's) shared some of their fondest ASP memories. Michelle K. (from my decade, the 90's) did an exceptional job. We sang a few of the songs we used to sing on a daily basis while working for ASP. It was a little emotional. There was an auction of memorabilia to benefit ASP. I ended up with a really neat framed photograph of a curvy mountain road. I like mountains. There was a contest to guess the number of skittles in a jar. Michelle R. & I both guessed 1200, which was the closest to the actual count of 1106. For this we won the skittles, which she yielded to me. Fortunately, the rest of the group helped pare that number down a little before we left. After the official reunion ended, the unofficial reunion moved to some bar in an extremely busy area of D.C. I should have planned a little better, but I didn't, and I ended up driving there. I searched for 25 minutes to find a parking place and I ended up in the tightest spot in which I've ever parked (and remember Iris is a very small car). We all got a little carried away chatting it up with old friends. I ended up getting back to my quarters at 3:30 am. I haven't stayed up that late in many a year. Juech was planning to run the Cherry Blossom 10 mile race at 7:30 am on Sunday. I since found out that he did indeed finish... barely. It was still probably before I even woke up.